How Can God be Real when there are so many Bad Seeds? Shay is a friend of mine. I met him one January day in California. I had daytripped with my family to Mt. Pinos, the tallest mountain in Ventura County at 8,847 feet, for a bit of fun: sledding, building a snowman, maybe having a snowball fight, picnicking, and otherwise romping around on the snow for several hours. So there we were: Holly, the four girls, and I—Emily, now 13, was two years old, to give you a point of reference; and she could lie down completely inside the snow saucer—so cute! I just had to get a family picture. We had a decent enough camera with us—this was long before phones had cameras. But it had no timer feature. So I looked around for someone to take our picture. And there! Yes, fifty feet to my right, I spied a youngish dad talking excitedly to his young son. “That’s the guy,” I told myself. Now, I said he was talking excitedly to his son. And well he should have been; for they’d just sledded down perhaps the biggest and fastest run on the mountain. But as I approached him, I realized he wasn’t speaking in English. So I began going through my mental catalog of languages. Spanish? No. French maybe? No, too guttural. German? No way. I’d taken a couple years of that in college. Yet this language was somehow familiar. What was it? I’d studied a little Hebrew and Greek. Could it be? Then it struck me. Hebrew is spoken in today’s world. Were this man and his son actually speaking to each other in Hebrew? Were they actually from Israel? We introduced ourselves—Shay, his wife Yael, and their two young boys, Zohar and Carmel. And we took pictures, shared picnic baskets, and played together, our two families, for the rest of the afternoon. We saw Shay and his family several times over the next year or so. We ate dinner in their home at Yom Kippur; they came to our church the day all four girls were baptized. Talking about spiritual matters with Shay came naturally. His backstory is one of growing up in Israel. As you probably know, this is a politically volatile place! As children, Shay and Yael commonly encountered soldiers on the streets, right out in the open public, with machine guns strapped over their shoulders. As they got older, both Shay and Yael spent mandatory time in Israel’s army. Yes, mandatory! And if my memory serves, that’s in fact where they met—in Israel’s army. That done, Shay completed college and went on to earn an MBA from the University of Tel Aviv by the time he was 28. He then married Yael and began his career and a family. Some years later he had the opportunity to work in the United States, in San Diego. So, that settled, they packed up all their things and moved to San Diego. They arrived, by the way, on Sept. 1, 2001. No violence. No wars. No threats to us and our children. Ten days later we all know what happened! Terrorism attacked our shores. For Shay and Yael (as for us), this was a huge blow. But to make matters more complicated, Shay’s boss was on Flight 11, one of the planes that crashed into the towers. And in this context, Shay, at 38 years old, found himself suddenly promoted to interim CFO of a successful international company. That’s his context. So I found myself very sympathetic to his worldview when one day he told me his perspective on the big picture. That’s his question: if God is real, why is there so much evil in the world? And it’s a good—albeit very difficult—question. Now I’m not even going to try to attempt to answer this question today. Biblical scholars with much more theological muscle than mine have been trying to answer this question for more than a millennium. Unsuccessfully too, I might add. Yet today’s Gospel—this parable about the wheat and tares—gives us some insight into this difficult question—and some lessons to draw from it. First, God knows our struggles. The kingdom of heaven, Jesus says, is like a field in which good seed has been sown; but also, it is assumed, a considerable amount of bad seed has been sown too—while no one was looking. An enemy did this, but he was stealthy about it, and thus no one realized it until much later. But the point is, it’s obviously here, now, in the present manifestation of the kingdom of heaven. Jesus never said that following him would be easy. This was a sort of modern American evangelical myth of the 1990s, or at least it was for me. “God loves you and has a wonderful plan for your life,” I was told. But how can you say that a family member suffering through cancer is a wonderful plan for anyone’s life? There is suffering, hardship, and downright evil in this world. It’s obvious! But guess what. It’s not only obvious to us; it’s obvious to God too. Jesus knows our struggles. That’s part of why he teaches this parable in the first place. Draw strength and encouragement from him. A second insight: there’s no room for spiritual judgment. We like to distinguish the good guys from the bad guys, don’t we? From early childhood we are encouraged to have a pride of place—whether it’s for a home team, a home state, a home nation, or a home political party. We have our people; they have theirs. And anyone who’s not on my team, well, they’re less than respectable. But not so according to this parable! The bad seeds are indistinguishable from the good, Jesus says, until they bear grain. Did you catch it? No one noticed the weeds, not even the master, until they bore grain! We’ve all done it. We’ve all had our judgmental thoughts. But whatever it takes, stop yourself from doing it again! Just don’t go there. And a third insight: the good is right there with the bad. The thing is—and it’s not easy to see it—God is already doing something. The good seeds are right there with the bad. Their impact is strong and solid. But, as the parable itself says, if God were to pull up the evil, the good would be uprooted too, right along with it. And none of us wants that! We cannot know the innerworkings of God’s grand design. That’s impossible! But we can believe that God is what the Bible says—loving, omnipresent, all-knowing, and all-powerful. Don’t lose sight of the good! Trust God: know that he has not abandoned you. Don’t be quick to judge others: God is helping them through their difficulties, just as he helps you through yours. And, on the flipside, strengthen others: God has put the good seeds right alongside the bad; be that good seed to everyone around you. 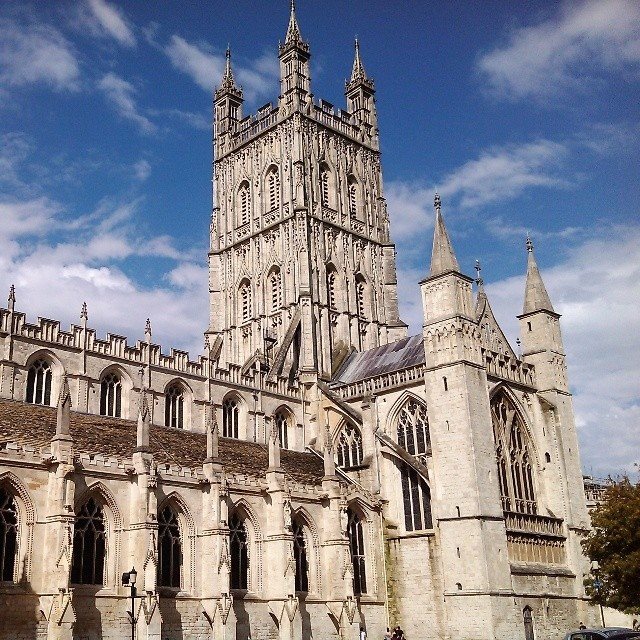 So my bride of nearly twenty-one years is off on an adventure to England, singing with a choir for the next week in this cathedral (Gloucester). She took this photo herself, in fact. This morning. In all, she will be away from me for ten days, the longest (I think) we’ve ever been apart since our wedding day. Ask me, then, how I really feel about this. Go ahead. She’s singing with a choir with which I’ve sung too for the last year, hoping (against hope, it turns out) that I too would be journeying on this pilgrimage. So ask me how I feel. Long have I loved the medieval English cathedral–whether this one, in Gloucester; or Durham; or Oxford; or, well, it doesn’t really matter. The flying buttresses, the stained glass, the vaulted ceilings commanding one’s attention upward, heavenward–one glimpses across the threshold of heaven when one enters these places of worship. But singing and worshiping and glimpsing heaven is not the only thing these pilgrims will be doing. There’s ample time in the schedule, oh yes, to visit some of the local eateries and breweries. Cask ale, I’ve heard, is something like the taste of angels weeping on one’s tongue. Oh well, guess I’ll have to keep imagining for now. Meanwhile I will be doing what I love, and spending concentrated time with the people I love most in the world–bride excepted. So there’s some consolation to be found in that. But whatever! Some people, too, find consolation in cheap American beer. Or in warehouses for church buildings. Or in happy-clappy mantras. Okay, that was kind of mean, I admit. But when’s it gonna be my turn already? My daughter just got back from four months in Italy. Now my wife is spending ten days in England. Not her first time overseas either! But I! I’ve studied the Greeks and Romans until I’ve dreamed in Latin! I’ve planned out a full semester-long European study tour, starting in Jerusalem and making my way, slowly enough to take it all in of course, to Scotland! I’ve sampled every British beer I could get my hands on! I even owned a Mini Cooper! Oh, not to mention a 1970 Triumph TR6! Yeah, right out of high school! And–AND–I even genuinely like futbol! And still–STILL! !–I’ve yet to go abroad. Like how I look when I try to line dance. The history of church planting in our country is a colorful one. In our early history, when our country was being settled, immigrants came from the Old World to the New. And they needed places of worship. So, naturally, many Roman Catholic congregations; as well as many Congregational, Lutheran, Presbyterian, and other Protestant congregations were formed. During this time, too, the Protestant Episcopal Church in the United States of America was born. Later, around the beginning of the twentieth century, after many so-called mainline denominations had been well established, there was the rise of what I shall call the preacher movement. This is where a preacher, usually a gifted one, would write a sermon, stick it in his back pocket, and go out to the streets to preach it. Once the preacher had gathered enough listeners to call the gathering a congregation, he’d start a church. The Mormon Church essentially began this way—as did many Baptist churches and the larger fundamentalist movement. Again a shift in church-planting methodology was seen after the end of World War 2. Mainline denominations continued to spread in numbers of congregations. But growth in overall numbers slowed and even stalled out. The preacher movement continued as well. But the tide was turning here too. Now, after two devastating wars and the loss of many lives around the world, humanity’s attitude had taken a pessimistic turn. The focus of church planting turned outside of the church, really, to parachurch youth organizations. Young Life and Youth for Christ formed during this time. Also, numerous youth camps such as the mega camp I used to work for, Hume Lake Christian Camps in California, began around this time. Next, in the 1980s and 1990s, came an intense focus on demographics. Who was our target audience? What cities around the country were prospering economically? If we were to plant a new congregation, where would the ideal place be in order to achieve sustainability most quickly? And if we’re after sheer numbers, we could argue that this worked. Saddleback Community Church—founded by Rick Warren in 1980 and reaching 10,000 members by 1990—arose out of such demographic sensitivity. Bill Hybels founded Willow Creek Community Church during this time too. But I add this. Today Bill Hybels and his pastoral staff say that they went about church planting and growth all wrong. Their focus was numbers. And numbers they got! But they saw way too little growth in Christ. Real followers of Christ, they say—real disciples—are lacking. Which brings us to today. How do we plant churches today? Or, perhaps a better question to ask, should we plant churches today? I came across an article this week from Leadership Journal[i] called “9 Reasons not to Plant a Church in 2012.” Written in January of 2012, it states that there has been disillusionment in the past decade or so with the overall church planting movement. It then lists the nine reasons for not planting churches. The preacher model, it says, where one gifted preacher goes out and gathers a congregation, goes against the biblical model of Jesus sending out teams. Studying demographics, it argues, excludes many segments of society from hearing the good news. Church plants, it claims, simply redistribute churchgoers from one congregation to another but do not bring in the unchurched. So, good question. How are we to plant churches today? Should we plant churches today at all? Or, to ask a broader question, what should our outreach look like? I love this parable. Don’t you? There’s a lot to learn from it regarding individual discipleship. There are four soils. Our hearts are like one of these soils. The first is hard like a road. The word of God falls upon these hard hearts and is not even considered. The second soil is rocky and shallow. People in this category are likewise shallow, so when rocky times come they forget the good news of God’s word. The third soil is decent enough, but thorns and thistles grow in it too. So when God’s word takes root, it is eventually choked out by the thorny concerns of wealth and pursuits of happiness without God. Only the fourth soil is where the good news lands, takes root, and multiplies. And this point rings loud and clear in our postmodern, individual-focused ears: Our hearts are to be like the fourth soil. We are clear about how this parable applies to us, as individual disciples of Christ. But what about when it comes to the Church? How does this parable apply to church planting? How does this parable apply to outreach—to illuminating San Antonio and the world with the light of Christ? To answer these questions we need to shift our focus a little—from the soils and their various conditions to the sower himself. Who is this sower? And what is he trying to accomplish? To answer the first question then, the sower is us. Fair enough, I answer; I see your point. Let’s say the sower is in fact Jesus. But what is the sower in this parable trying to do? He’s trying to plant a crop that yields thirty, sixty, or even a hundred times the original. And the original is no shabby quantity! He’s scattering seed on the road, in the rocky soil, among the thorns—everywhere! He has an abundance—a point to which I will return. Present point is, he’s got this over-abundant original quantity—already seemingly more than he can handle on his own—and he’s hoping to multiply it by a hundred: he’s going to need some help! And if this sower is Jesus, as you yourself suggested, then who will help him but his disciples? And who are his disciples but us, the Church? But it’s not just about the seed. So, to answer the second question: the sower is hoping to plant and sustain a healthy, productive crop. And where does a healthy, productive crop come from? Why, from the plant itself. Do you see? Churches are the plants that produce the seeds of good news for the world. And only healthy churches will produce thirty-, sixty-, or a hundredfold. But plants have a life, don’t they? Some plants live for only a short time. Others, like the Giant Sequoias up in the mountains by Hume Lake Christian Camps, live and thrive for thousands of years. Either way, though, new plants must come along in order to keep the seeds coming. Now let’s return to our question about church planting and other forms of outreach. From this parable I think it’s rather obvious that churches are the healthy, productive crop Jesus has in mind. I think it’s rather obvious, too, that churches should be in the business of producing seeds of good news and spreading them across the world. It’s not just the preacher who sows. It’s not just the clergy. It’s not just the people and institutions that are involved with establishing new church plants and maintaining them. Outreach is so much more! Look again at the sower of this parable. He spreads seeds of good news far and wide. The picture is one of carelessness, even recklessness. He scatters seeds seemingly everywhere—on the road, on rocky soil, on weedy soil, and on good soil. He has an abundance. So do you. You are blessed beyond measure. You commune with the King of kings, week after week, at his very Table. You have a community right here that loves and cares for you even when you feel ornery and alone. You have hope where many others have none. These are the seeds of the good news of Christ. And there are so many others! And you carry them with you wherever you go. An over-abundance of them! So scatter them all around you. Fling them about you carelessly, recklessly, even thoughtlessly, wherever you go. Someone calls your name from behind and you turn suddenly. There, in that sudden turn, hundreds of seeds are shaken loose from your clothes, your hair, your pockets; and you’re not even aware of all the good news that has fallen from your person. That’s the picture here, right? This is outreach. This is how you and I are going to illuminate San Antonio best. It’s not about demographics. It’s not about being a gifted preacher. Outreach is about Christ in, on, and all round you.